Claustrophobia - the fear of enclosed spaces - can be a debilitating condition. 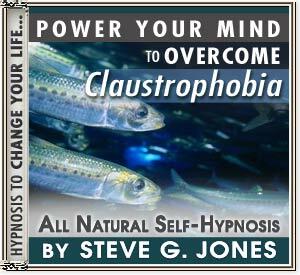 This Overcome Claustrophobia hypnotherapy Cd or overcome claustrophobia MP3 will train your brain to be as comfortable in enclosed spaces as other people so that it does not need to generate anxiety responses for you. This Hypnotherapy to overcome claustrophobia MP3 or overcome claustrophobia hypnotherapy CD is so effective for doing this because it keeps you calm and relaxed while distantly reviewing any difficult situations or experiences, so teaching your mind to respond differently. As this happens, you will begin to feel different about the thought of situations that used to be frightening.